Church and Town of Louth, Lincolnshire. An antique line engraving by J.W. Lowry after T. Allom. Published in 1837 with later hand colouring. 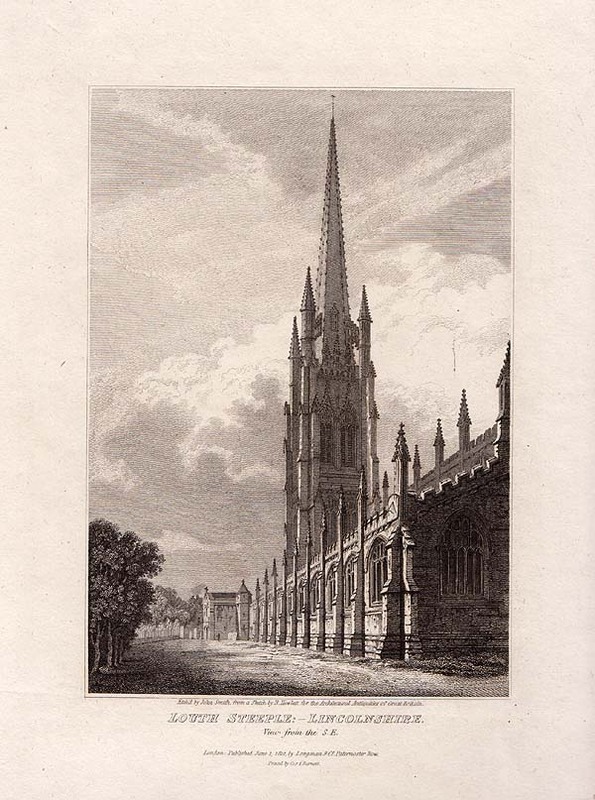 An antique line engraving by W. Watkins after B.G. Topham. Published by John Saunders Jnr. in 1834. Later coloured by hand. An antique line engraving by Rock & Co. Circa 1860. Later coloured by hand. All margins slightly cropped. Louth Church. View of the east end. An antique etching by B. Howlett from a sketch by himself. Published in 1812. Louth Steeple, Lincolnshire. View from the S.E. An antique etching by John Smith after B. Howlett. Published in 1812. Louth Church, Lincolnshre. View of the East End. An antique line engraving drawn and engraved by B. Howlett. Published in 1812.